So there is an article circulating online (citing a study by the National Low-Income Housing Coalition) stating that a full-time worker earning minimum wage can’t afford to rent a one-bedroom apartment anywhere in the US. The article seems to hint at the fact that this is the result of too low minimum wages (and too high inequality) in the US. But is the situation any different in countries with lower inequality and more generous welfare states? What do the figures in Europe look like? In this post, I perform the same analysis for Europe. The criterion for affordability is that your rent does not exceed 30% of your income. I don’t know whether this is a good indicator (sounds too harsh to me), but my results suggest that if it is then the vast majority of the world’s countries are failing miserably at making rents affordable for minimum wage earners. In Europe, rents are affordable only in France and in Germany, kind of. 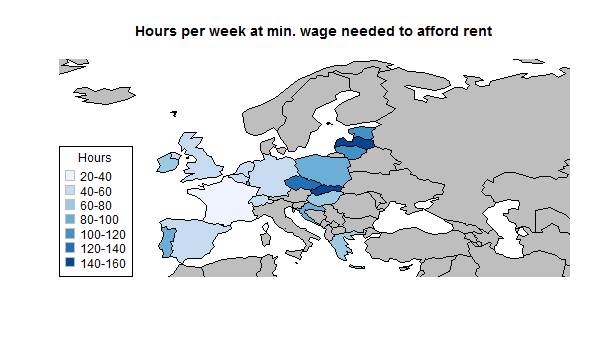 The figure below shows what percentage of one’s minimum wage salary would go towards rent in each European country. The red line indicates the 30% cut-off. Of course, the data is a little sensitive depending on what cities we look at. I tried to find a city of around 400-600,000 inhabitants in each country. These are usually the second largest cities within the country, but in some cases they are the capitals and biggest cities. Similarly, the figure below shows how many hours one must work a week at minimum wage in order to make rent affordable (30% of monthly income). It’s important to note that these are pre-transfer, pre-tax minimum wages. Actual take-home wages may differ. They may be lower (if there is a tax on minimum wage), or even higher (if minimum wage earners are entitled to transfers exceeding their tax burden). Altogether though, these numbers are probably in the ball park (at least for childless people). A second thing to note is, as mentioned above, the results are somewhat sensitive to what city we’re considering in each country. Capital cities in most countries will be even less affordable than the numbers presented here, but smaller cities will be likely more affordable. And a third thing to note is that it’s possible that rent is affordable in more European countries. The thing is that Scandinavian countries (Sweden, Norway, Finland, Iceland, and Denmark) as well as Austria and Italy have no official minimum wage. So it’s impossible to perform this analysis for them. I guess my point is just to show that the situation in the richer parts of Europe is about as good as in the richer parts of the US, and the same for poorer parts. Europe is not doing better than the US when it comes rent affordability for minimum wage earners. This may come as a surprise given how much more extensive the welfare state in Europe is. UPDATE: one potential way to turn this analysis around in favor of Europe is to say that the 30% rent affordability threshold is too harsh for Europe but not for the US. Why would this be the case? Perhaps because more public goods are provided in Europe (e.g. health care, public transport), which may allow households to spend more of their wages on rent. I’m not saying this is the case, it’s just a hypothesis. 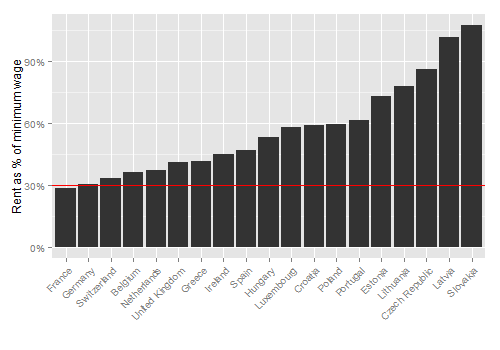 Source: rents from Numbeo for selected cities, minimum wages from Wikipedia. The R code, which can be downloaded here, contains the full data set as well as the list of cities used in the analysis. The analysis is fully reproducible. This entry was posted in Labor Economics and tagged inequality, minimum wage, rent. Bookmark the permalink. ← Are parents more risk-averse?